Great comforter for the price. I will buy the same comforter when it is time to replace this one. I like the weight of this comforter, lighter but yet keeps you super warm. Made to be light, fluffy, and airy, this down comforter is perfectly suited to all seasons. This staple of bedroom comfort is a lovely addition to any sleep space, ensconcing you in the ultimate softness. I compared this to many other down comforters on Overstock.com. This one has mainly goose down filling and not feathers (95% down, 5% feathers). As a result it is extremely warm. You can use it and sleep in a very cold room and be warm without a problem. It didn't have any smell as a lot of comforters seem to have outside of the box. Finally, it was fluffy, but probably not the fluffiest I have slept in. Overall a great value & great product!!! I have already bought one of these comforters as a gift. My friend was so thrilled with it that I am buying one for myself. I love the fact that it's an all weather comforter .The softness of the fabric against your skin combined with the perfect warmth for any time of year. The weight is just Perfect. The comforter is a steal at this price, you can't come near this quality and price ...... even the outlets. I know, because, I am always on the lookout for a great deal!! You have to get one! I researched for months for a down comforter. As I am not in a position to spend hundreds of dollars, I was looking for something I could afford and that was good quality. Well, I found it! This comforter is not only affordable, it is the most comfortable, light, fluffy and well sized comforter ever!!! I live in Pennsylvania - freezing in the winter, hot in the summer. I have it on my bed all year. It came out of the package with no smell, and fluffed up in a matter of hours. I would highly recommend this comforter to anyone who is looking for the feel and quality of a high dollar one, but doesn't have a fortune to spend! Thnaks for the great product Overstock! I'll be back! This comforter was exactly what I had been looking for. I did a lot of research on what kind of comforter to get for warmer summer nights in Michigan with a warm-blooded boyfriend. This blanket feels nice and comfortable, and does not over heat either of us. The thread count is good because too many threads will weigh down the filling, and the fill power and ounces per baffle box are also good for a light warmth down comforter. I did not notice any unplesant smell when it was opened, just a little like plastic which went away quickly. It fits our king sized bed just fine. It appears to be very good quality. I would recommend. I bought one for me and I love it, so I bought another one for my daughter for Christmas gift. It¿s the only thing that I use to cover me at night and it keeps me very warm. The temperature has gone down to the low teens this winter and I am perfectly fine with this White Goose Down Comforter. Buy it with confident you will like it. I Love it! I ordered this comforter several weeks ago and have been enjoying it for the last two before writing this review. The thread count of the cover itself might be on the lower end, but the warmth value is plenty for us so far (we live in Ohio). Between this and the Soft Velvet Cafe Duvet Cover Set that I also purchased, our bedroom has never felt so luxurious! This comforter is exactly as advertised. The white fabric is very crisp in color and is very warm and comfortable! The price was unbelievable! I would highly recommend this with one caveat; if you are after super soft, you need to go up in thread count. My thinking was that I was buying a duvet cover with a much higher thread count, so I didn't need to spend them money to go higher on the comforter. My daughter is in 7th heaven with it since her room's the coldest in the house. 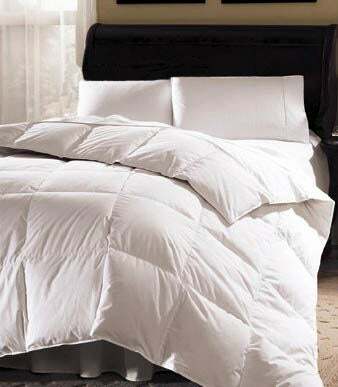 The Aurora white goose down comforter is perfect for me. I live in the Northeast but I was able to use this comforter year round. It was never too warm in the summer or too cold during winter. The square pockets are great and keeps the down evenly distributed. I owned several down comforter before but this is by far my favorite. The price was originally why I picked this one but this comforter exceeded my expectation. i wasn't sure what to expect from this purchase but the price was right. the package showed up on time and was a great addition to my bedroom. the fabric is decent and the cool/warming effect of the goose feather is right on. I'm trying to find a duvet cover to fit this full/queen 86 x 86 comforter. I've bought two of these! I bought a full size first for our daughters' bed and when they got bunk beds I order another in the single size. Now I am kicking around buying another for our bed. It is a great value. I have other comforters from The Company Store which I paid double for and I believe the quality is very similar. Buy with confidence! I bought this for my daughter & her husband They love it! Well made very cozy from what she tells me. I bought a king size even though they have a queen bed. I would recommend this to everyone. I love, love, love this comforter. Soft, perfect weight, excellent value. We returned it because it didn't meet our expectations. It was very noisy and the touch didn't feel nice. Very thin, not much weight to the comforter. This is a great "puffy", must be mostly down, not feathers because it is light but very warm . It has no feather odor, no crackly noises. The lining is soft and smooth.Initially the comforter was pretty flat, although there was no clumping of the filling and it was very uniform. I shook it slightly and laid it over the bed knowing that it would likely puff up over time. When I returned to it a few hours later, it was still pretty flat so I just shook it in two or three large sections and it plumped up nicely.You have a great product here! Some people don't like the crinkly sound of down feathers but my husband and I love the sound, the feel, the luxurious feeling of our king size goose down comforter. The filling was light weight, as promised. However, the Ifilling did slip around through the baffled squares, leaving some squares almost empty. Love this comforter! Don't let its light appearance fool you. It is fluffier than it looks! I bought this to go with a Pottery Barn Belgian flax duvet. I was so excited because my last blanket ripped and we had been sleeping with a quilt. My boyfriend gave me a hard time about the amount I spent on the pair and had some negative feelings towards the blanket as a pair going into it. “It’s not THAT nice” he said. He and I both thought, before spending a night in it, that the comforter had a sort of plastic/garbage bag sound when you moved it around. Hard to explain but didn’t get the whole “this thing is gonna be amazingly soft!” Vibe. I’ve never owned one of these so I’m not sure if the sound just comes with it. It fluffed up pretty quickly when I pulled it out of the package though. When I put it together I noticed that neither the duvet or comforter had ties to hold them together, which would have been nice but I can sew some in myself. The morning after our first night using the blanket pair NEITHER OF US WANTED TO GET OUT OF BED. IT WAS HEAVEN! The blanket is heavy but light. You feel like you are under a sea of blankets but don’t get too warm. I’ve done the last two days of my homework in bed, which I never ever do. It’s been cold and the only place I want my feet is under that blanket! Boyfriend has retracted all statements and this morning when I asked “so you like it?” He said “I don’t like it... I love it!!! I feel like I’m in a resort.” I would have liked to only deduct half a star for the missing ties but overstock doesn’t do that. I just want some people to know they’re missing if that’s a deciding factor :) if you’re handy and can make it work though, great buy!!! Had this a long time and really like it. Very warm in the winter. I love the weight of it and the baffling has been great, all my squares are still fluffy! "Are there buttons to hold the comforter in place with a duvet cover?" This does not have buttons. "Can this be inserted in a duvet cover?" Yes, this can be inserted in a duvet cover. "What is the percentage of down vs. father? " This item is a white goose down comforter and not a feather mix. So there is no percentage if feather in this comforter. This comforter consisted of 75% cluster of white goose down. I chose this because of the reviews, and that is is white goose, and perfect for a TX climate. This product is not yet released, and is expected to ship on Sep. 30, 2005.